The Ha-ak Va-ak (“Ha-ak slept here”) intaglio, listed in the National Register of Historic Places, is a figure etched into a Pleistocene soil deposit at least 10,000 years old. The figure depicts Ha-ak, a witch who preyed upon O’Odham children. Of unknown age, the figure covers an area 200 feet by 1l0 feet. The intaglio consists of the figure of Ha-ak, a child victim, and another figure, which has been described as either an arrow or the figure of Se’ehe (Elder Brother). Se’ehe destroyed Ha-ak at the request of the O’Odham. Offerings are still left at the intaglio. An old fence built to protect the intaglio had completely collapsed, leaving the figure of Ha’ak and the surrounding area vulnerable to grazing cattle, wandering burros, horses, and unauthorized all-terrain vehicles. Our Phase 1 grant allowed us to replace the dilapidated fence surrounding the Ha’ak figure with a professionally installed barbed wire fence. We were able to maintain pedestrian access for our people by designing an animal proof entrance. We marked the boundary of the intaglio by placing warning signs on the fence at strategic locations. Once the fence was completed, we observed a surprising development. The wild burro herds that wander the area were using the new fencing as scratching posts, bending the fence and fence posts. We did not know how large the population of wild burros were in the area and had to reinforce the entire fence and repair the damage. 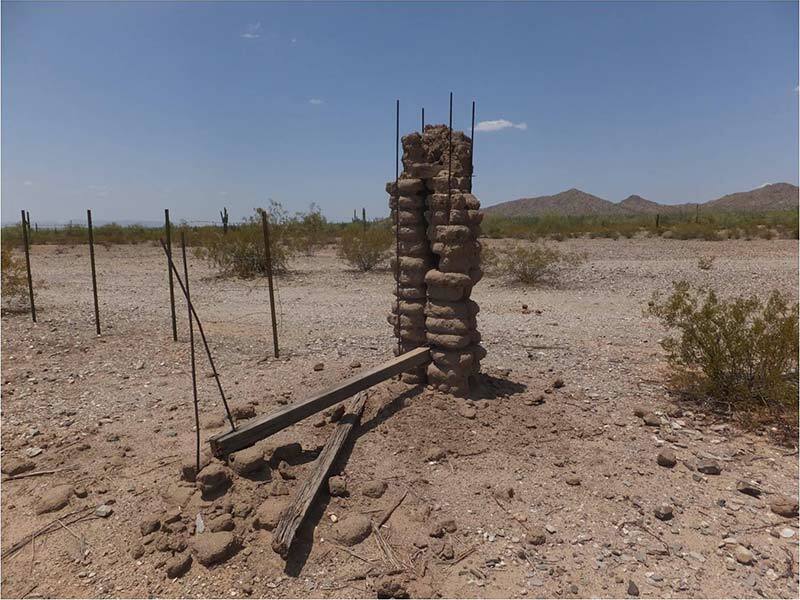 After reinforcement, the fence is able to withstand the wild burros and their preference to use the fence posts for scratching. 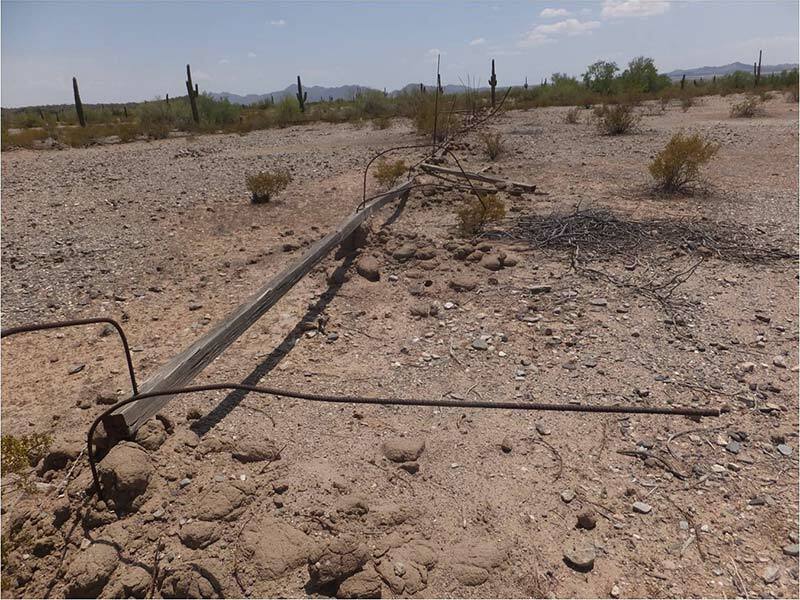 Donated time was provided by GRIC Rangers and GRIC Land Use and Planning Livestock officers to reinforce the barbed wire fencing. When we were presenting project accomplishments to staff from other departments, to our standing council committees, and to the Governor and the Council, another unexpected development occurred. Some Community members unfamiliar with the oral history of Ha’ak heard the history for the first time. When they were able to connect the oral history to an actual location, it became much more meaningful to them. For the Gila River Indian Community’s Tribal Historic Preservation Office, the preservation and protection of our ancestral places across the landscape is a primary responsibility to our ancestors, our culture, our people, and our Community. When those places are destroyed or damaged, it cuts the links to our ancestors and to the past, and adversely affects our people. We do our best to protect these places because it enhances our lives and culture. The project has been completed to the satisfaction of our Community Tribal Council and our people. The grant provided us the opportunity to continue a meaningful, enhanced existence.